What's an Allergy Test Like? Think you have allergies? Getting a test with an allergy specialist is the clearest way to find out. What should you expect with a test? The most common type is a skin-prick test, also known as a patch test. In this process, a nurse or doctor uses a series of tiny needles, or lancets, to push potential allergens just under the skin’s surface. After about 15 or 20 minutes, skin reactions (usually mosquito bite-like bumps) typically develop at the application site of anything that makes someone’s allergies flare. By the way, if you’re having needle nightmares right now, take some comfort. The test doesn’t use shot-type syringes: They’re incredibly small and typically cause no bleeding. Most patients say that they feel just a little discomfort — not pain — and that it quickly fades. Testing is typically done on the forearm for adults and upper back for children. 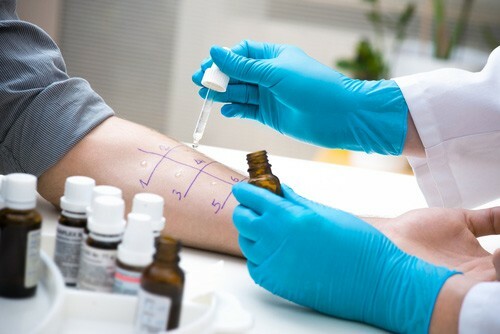 About 40 potential allergens can be tested at once, so the nurse or doctor will make temporary marks on the skin to show what’s been applied where. Histamine. Most people react to this substance. So if it’s applied and no bump forms, then a doctor will know that the skin-prick test might not reveal other reactions, either. Saline or glycerin. Most people don’t react to these. If they’re applied and bumps do form, sensitive skin might be to blame, and the test results should be read extra carefully. If the skin-prick test is inconclusive, or if a doctor needs to investigate a certain allergen further, then a “skin-injection test” might be done. This means that a larger amount of medicine is injected with a syringe to see if the skin reacts. Certain medicines (like antihistamines, some antidepressants and specific heart medications) can interfere with a skin-prick test. So before having an allergy exam, tell your doctor what medicines you’re on. Blood tests can be done for some patients who can’t go off specific medications. If you need to get to the bottom of your allergies, check with us anytime. The sooner you find out your triggers, the sooner you can treat those symptoms!